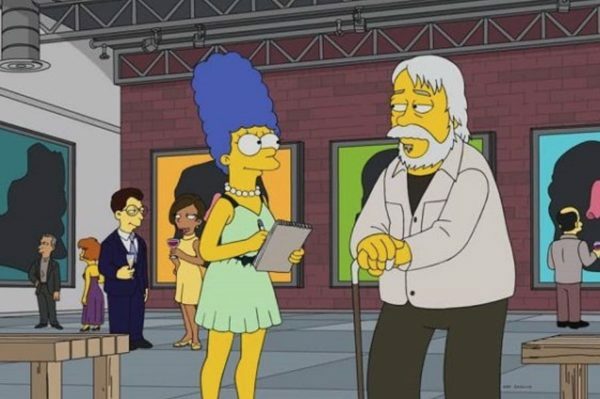 John Baldessari gets the greatest accolade of them all – a guest turn on The Simpsons. Banksy guest stars, sort of, on the latest episode of HBO’s Silicon Valley. Good grief, Charlie Brown! You’re graffiti? Frick Collection, with fourth expansion plan, crosses its fingers again. Berkshire Museum sell-off approved by top Massachusetts court, ending a lengthy legal battle. 314 rare books stolen from Pittsburgh’s Carnegie Library. A massive new cultural center funded by Saudi Arabia’s oil company prepares to open. Tate gallery’s staff pull off Inside Job to showcase their own artwork. Italian far right wants to turn Fascist HQ into mega-museum. What’s the best path to a top museum job? We analyzed the training of 100 curators to find out. Gender pay gap: top UK auction houses pay women between 22% and 37% less than men. ‘Simply Not a Good Look’: Activists criticize Brooklyn Museum’s hiring of a white African art curator. New York judge awards Nazi-looted artworks to Holocaust victim’s heirs in key test case. Judge throws out closely-watched lawsuit against the Agnes Martin Authentication Committee. Jose Parla breaks down ‘Amistad America’ for ‘Landmarks’. Watch JR discuss how his “Inside Out” art project came to be. OSGEMEOS on what it takes to be a legendary graffiti artist, or two. Noguchi Museum announces two new exhibits for late Japanese artist. James Rosenquist’s stunning ’60s pop artworks to show at ARoS. It’s no illusion: M.C. Escher’s mind-bending works are coming to Brooklyn. Why one collector bought a work of art made by Artificial Intelligence—and is open to acquiring more. How can one artwork have four very different price tags? What’s your favorite color? With Art Palette, Google hopes to repeat success of viral face-matching app. Russell Crowe celebrates divorce by auctioning $1 million USD worth of belongings. Picasso’s broad brush lifts the market. Christie’s announces $70m Picasso self portrait. A long-lost Dutch painting worth millions turns up in an Iowa closet. How does Banksy make money? (Or, a quick lesson in art market economics). When he wasn’t making history, Winston Churchill made paintings. An anarchist art collective transformed a Trump Tower Hotel suite into a prison cell for the President. Frieze New York will present Adam Pendleton–designed Black Lives Matter flag. Art dealers strike back at Cady Noland in increasingly philosophical legal dispute about a restored sculpture. Lara Schnitger seeks volunteers for feminist performance at Frieze New York. Marina Abramović plans to electrify herself with one million volts. Apply to the Artist Studios program at New York’s Museum of Arts and Design. Before Van Gogh was a painter, he was an art dealer. How Van Gogh imagined Japan. Volta announces new location for 2018 Basel Edition. Condo Gallery shares program names participants for 2018 edition in Mexico City. Kenny Schachter tries (and fails) to keep his mouth shut at Gallery Weekend Beijing. Damien Hirst hates sausages! How Instagram became art’s new playground. #Duchamp? Darren Bader is selling his Instagram and Twitter handles as readymade art. Categories: Contemporary Art, Features, Overtime, Street & Urban Art. Tags: Contemporary Art, Features, John Baldessari, Overtime, slider-featured, Street & Urban Art.